Ever played on an online slot with ‘repeating’ capabilities? Get ready for some action on Red Hot Repeater by gaming giants, Novomatic. Spin – Win – Repeat. Go some fruity wins on Red Hot Repeater 5-reel and 10-payline online slot. Play this game from any device from 40p per spin and enjoy up to 2000 non-progressive coin jackpot and special features. Contrary to expectation, this game is not about Red hot peppers. As the name implies, this game is all about repeat wins. Please check out list of the most reputable UK online casinos to know where to play this and other thrilling online slots. Visually, Red Hot Repeater is basic and looks like a classic fruit machine. If you are looking for more exciting designs, you can always try out online slots with unique layouts. Imagine flaring hot flames in the breeze, burning for wins. That is what you get with Red Hot Repeater slot machine. Find your reels encompassed by gold and black arrows and if you look closer, you’ll see a red-hot fire dancing around the screen. Symbols include an array of fruits; oranges, plums, lemons, strawberries, cherries, grapes, pears and melons. There are also little bluebells and the lucky red number 7s. The lucky red 7s is the highest paying symbol. Land 5 on a payline and win a 50x multiplier on your stake. To get a winning combo, you must land 3 matching symbols starting from the leftmost side of the reel. Land three matching combinations to trigger the Repeat Mode. You have a chance to sip on some juicy wins in this feature. You will see the flames glint in an infinite loop that surrounds the reels. If the black or gold arrows stop on ‘Repeat’. You will win the same amount on repeat. The feature will continue as long as the arrows stop at ‘Repeat.’ For the lucky ones, the repeat wins are subject to bonus multipliers from 2x to 10x. 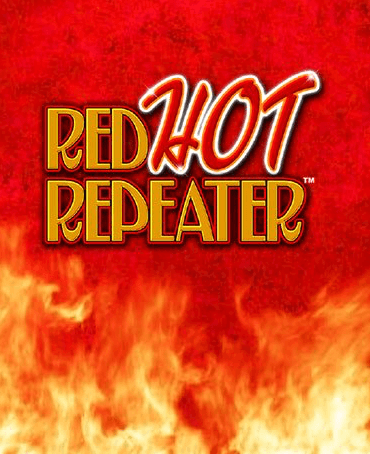 In conclusion, Red Hot Repeater is a simple slot, with animations that you would typically find on Novomatic games. However, you maximise your wins everytime you place an 80.00 stake or trigger the Repeat feature. You can also check out other online slots with interactive bonuses. Although Red Hot Repeater does not come with Free Spins, there is still a medium variance and a 95.67% RTP to enjoy.